Grading - What is it? The minefield that is card grading, something all of us CCG enthusiasts must traverse at some point. It affects both buyers and sellers and can have a very positive and sometimes negative impact on the community. This article is here to outline how we grade our cards, in an experienced honest and fair way. Many online stores and some companies dedicated solely to card grading have their own ways and means with which they grade their cards. Some with their own categories (such as "Played" or "Unplayed") and some with a points score out of ten. In my experience, these different tags can mean very different things to many different people, this can be confusing, as card grading is like art - It's subjective. To some a small nick in the corner of the card would downgrade the card from a 10 to a 7, whereas to others that same small nick would only push it down to a 9, or, If a card has a shuffle crease down it's center it may be considered "heavily played" by some, but only "played" by others. Grading - Why do we need it? Grading is done for a few reasons. but mostly to help scale our quality. Firstly it gives us an idea that a card fresh from the pack is more valuable than one that has been used for a couple of years in a deck, it helps to diversify the market and give us gamers some checks and balances to aid us in our decision making process over how we spend our hard-earned cash. In the same way that you would expect in the Food industry - you'd want to pay less for something outside of its best before date, wouldn't you? Or if you were buying cosmetics, you'd think twice if that lipstick was already used, right? Now obviously cards don't expire, but their condition heavily affects the cards value and its desirability - especially in older cards, specifically from an investment point of view for the Alpha and Beta sets of Magic: The Gathering, but also for baseball cards from the 40's and 50's and other collectible and valuable cards within this sector. Grading - How do I approach it? In our humble experience, having been involved with Magic: The Gathering since its very early days, it is very unusual to get a truly "Mint" condition card and even then the card has been unwrapped, pushed into a sleeve or card container and stored until sold - which to us, means that by the time that "Mint" condition card gets to you, there's a very high chance that the card, whilst still in pristine condition is actually "Near Mint", therefore we do not label any of our pristine condition cards as Mint, only as NM. There are of course exceptions, but they are rare. As we move down the grading scale, the categories become more ambiguous and a little harder to define. For instance, what pushes a card beyond Good into poor? How many small white nicks does a card need to have until it moves from Excellent to Good? For us it's simply common sense. At the bottom of this page are some images to show what we would consider each category to be. If anything happens to be borderline? We'll downgrade it. This is the easiest fairest and safest way we've found to grade our cards. Grading - Who grades cards? Most sellers like us grade their cards themselves, if you're new to it and you're going to start grading cards to sell, make sure you have a firm idea of the market expectations. Do your research and don't over-complicate it, be honest, fair and most importantly - put yourself in the customer's shoes. If you received that "Mint" condition card, would you be upset to see that small nick on the edge? Grading - Where do Foil cards fit into this? Ah. Foil cards. They are much harder to grade accurately. Throughout the years since TCG's started including shiny foiled cards or "Premium" cards, there have been numerous problems with the quality. The most common problem for many was the 'curling' issue. Many premium cards had a tendency to curl up as the cardboard proportion of the card shrank and expanded around the foiled layer due to poor storage climates, some even arrived in the box or pack curled due to air/moisture exposure. Other issues such as ink bleeding and printing slips were rife for a while and many of these so called 'premium' cards were regarded as inferior to their regular card versions, despite their rarer availability. As years went by the foiling process at the point of manufacture became better and more advanced and nowadays there is very little curling or printing errors - although scratching can still affect foil cards more than others. Due to this we ALWAYS sleeve our foil cards and keep them sleeved, for more expensive foils, we will double-sleeve them to minimize exposure to the air and to avoid scratching while being stored. As a general rule for grading foils, we would ignore any minor curling as this is the natural state of these older foil cards, instead we concentre more on the physical qualities and the inking to ensure no quality errors are present. Fading can be a problem, some being so faded and dark it becomes difficult to see the artwork and printing if it's a particularly dark piece. For these issues and major curling we would consider downgrading the card. 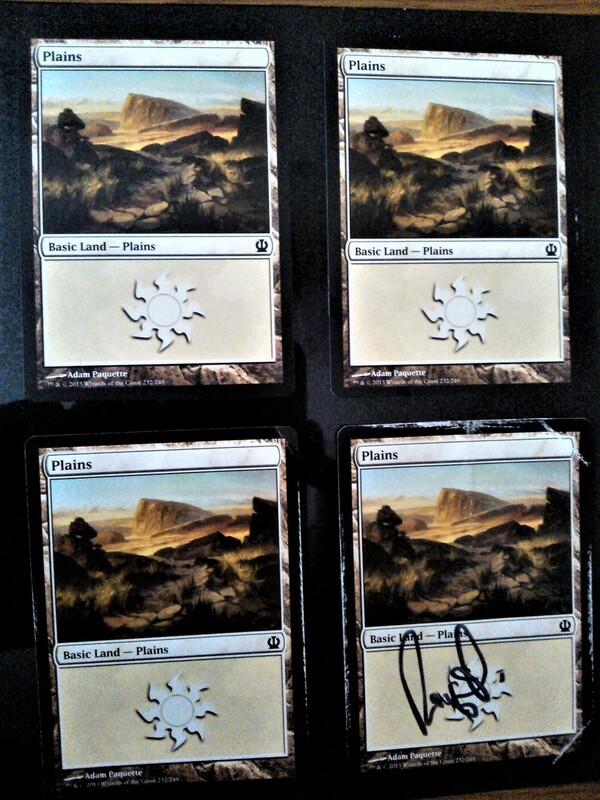 Artist Signatures can be again, a very subjective issue for different players and collectors. For us and many people we speak to, the generally accepted approach is that signatures on the cards devalue them by one grade. For instance, if the card is in EX condition, and is signed, it would be considered as GD. This is usually for two reasons, firstly, on average, players prefer their cards as pack fresh as possible, and secondly, signatures are sometimes falsified in an attempt to add value. Valuing signed cards this way can work out nicely for signature collectors as they will usually get a cheaper price, but can be a sticking point for sellers who highly value their collection of signed cards and expect a higher price. To help both buyers and sellers, we try to offer some credence to the card by mentioning where the artist was met and when it was signed, if we can we will also add clear scanned pictures. Thanks for having a read, we hope our thoughts have been helpful!